What occurred to me on this day will likely never occur to me again, or at least so I hope. That morning, while driving through the town of Vernal, in northeast Utah, I suddenly noticed lots of vibration together with loud noises coming from the rear of the SUV I had rented the day before. I stopped on the right shoulder only to discover a huge stake (around 10 inches), like those used in camping tents, coming out of the rear left tire. Lady Luck kind of came to my rescue, as there was a tire dealer right across the street, where I managed to get the tire fixed in a couple of hours and a few dollars, not being able to avoid wondering if it was just coincidence that a stake was lying in the middle of the road right by the dealer. 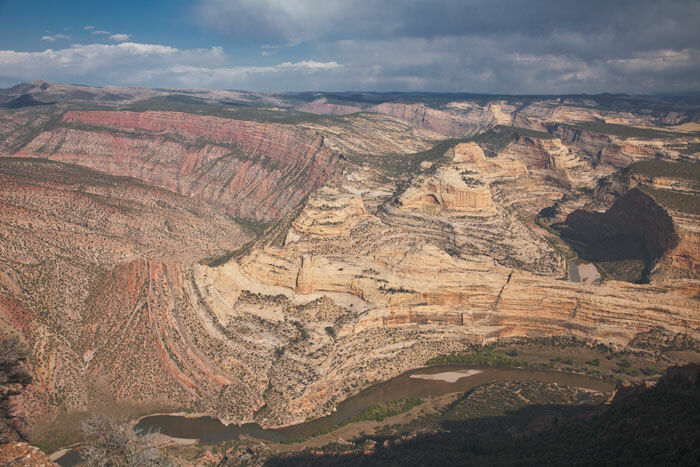 Relieved at not having lost that much time, I proceeded with the original plan, driving east and then north through a downpour to reach the Harpers Corner Overlook within Dinosaur National Monument just as the sun was breaking through the last clouds of the storm. It was my first time here, and although I had high expectations, I was not ready for the magnificence of the place, which kind of overwhelms you. You find yourself on top of a huge cliff, with the Green River down below flowing along the prominent mass of Steamboat Rock (made famous by Major John Wesley Powell in his failed climbing attempt during the historic 1869 expedition), feeling tiny and insignificant when compared with the vastness of the place. I would say it radiates some kind of "feel good" energy, or at least	so it felt. Having already forgotten about the tire incident, I happily proceeded to drive the steep but not technical track down to the river, where I was planning to spend two or three nights at Echo Camp (a.k.a. Center of the Universe) while exploring the area around the confluence of the Green and Yampa rivers. My good mood did not last long, though, as close to the bottom history repeated itself. Loud noise, stop, swear, and this time it was not a flat but a sheet of metal making a three inch wide hole in the same tire as before. What are the chances? Tire was totaled, with the vehicle tilting heavily as there was no pressure left inside. This time I had to get my hands and everything	else dirty, remove the spare (about half the size of the original) from below the undercarriage, and use the jack to lift the three-ton behemoth in sandy terrain. Exhausted and with the night falling in, I rushed to drive the few remaining miles until camp without knowing that the surprises were not over yet. Although I had specified online that I wanted a 4WD (four wheel drive) vehicle, the one I was given did not have the desired 4WD handle, but had AWD (all wheel drive) written all over the place. I inquired the guy at the counter, who explained me that AWD meant that the 4WD connection mechanism was automatically controlled by a computer, which connected it as required, instead of manually by the driver. What he did not add was that the smart software engineer who programmed it believed it was a good idea to disable the system if it detected some kind of anomaly, such as one wheel being smaller than the others. So if you find yourself needing the spare tire when you are in one of the most isolated roads of the contiguous forty-eight, with miles of wet mud and rocky steep ramps between you and the nearest paved road, make sure you have some real 4WD instead of a normal 2WD vehicle with lots of dead weight and a blinking "AWD disconnected" light on the dashboard. As I could not enjoy myself the next day without knowing if I was going to make it back or not, after lunch I decided to cut my stay short and give it a try, being fortunate to reach the same tire dealer as the day before without too many	troubles. All rights reserved. All images and content are the copyright of Eduardo Gallo. No form of physical or electronic reproduction, duplication, or manipulation is authorized without a written license from Eduardo Gallo.